«Grass never grows on the road where people walk by», says an African proverb. That is probably why the musicians of Diouke, rather than following the beaten tracks, let their sensibility flow free. The heart of Diouke ("Stand up!" in Wolof, the language of Senegal) beats to the rhythm of two pulsations: the one of the kora played by the Senegalese Abdoulaye N'Diaye (kora and voice), heir of the Griots' tradition, and the one of the French cello-player Matthieu Saglio. 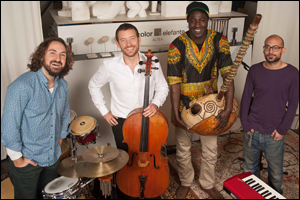 These two string instruments loaded with history, one African and the other European, unite with the more jazzy colours of Alfie Copovi's keyboard and the inimitable percussion set of David Gadea. Their first album, recorded in 2012, has been largely complimented by all international reviewers.